The House (according to Order) was in a Committee on (fn. 1) this Bill. And, being resumed, the Earl of Warwick reported, "That they had gone through the same, without any Amendment." Late E. Anglesey's Will, Bill for exemplifying. The Lord Bishop of Bristol presented to the House (pursuant to their Lordships Order Yesterday) a Bill, intituled, "An Act for exemplifying the last Will of Arthur late Earl of Anglesey; and for making the same Evidence in all Courts of Law and Equity in Great Britain and Ireland." Judges to prepare a Bill for exemplifying Wills, &c.
The House was moved, "That the Order made the 24th of March 1728, for the Judges to prepare and bring in a Bill, for the Exemplification of Wills, and making such Exemplification Evidence, might be read." Ordered, That the Judges do prepare and bring in a Bill, for the Exemplification of Wills and of Deeds enroled, and for making such Exemplifications, and authentic Copies of such Deeds enroled, to be Evidence in all Courts of Law and Equity in Great Britain and Ireland. Banks's Petition referred to Judges. It is Ordered, That the Consideration of the said Petition be, and is hereby, referred to Mr. Justice Fortescue and Mr. Justice Chapel; with the usual Directions, according to the Standing Orders. 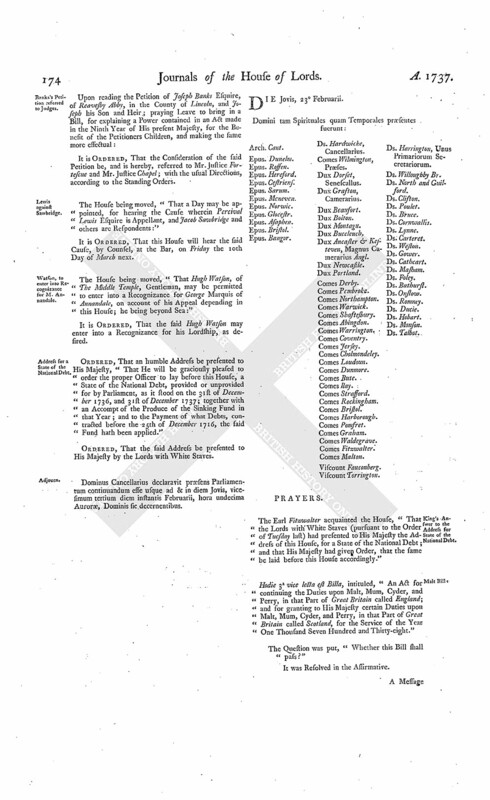 The House being moved, "That a Day may be appointed, for hearing the Cause wherein Percival Lewis Esquire is Appellant, and Jacob Sawbridge and others are Respondents:"
It is Ordered, That this House will hear the said Cause, by Counsel, at the Bar, on Friday the 10th Day of March next. Watson, to enter into Recognizance for M. Annandale. The House being moved, "That Hugh Watson, of The Middle Temple, Gentleman, may be permitted to enter into a Recognizance for George Marquis of Annandale, on account of his Appeal depending in this House; he being beyond Sea:"
It is Ordered, That the said Hugh Watson may enter into a Recognizance for his Lordship, as desired. Ordered, That an humble Address be presented to His Majesty, "That He will be graciously pleased to order the proper Officer to lay before this House, a State of the National Debt, provided or unprovided for by Parliament, as it stood on the 31st of December 1736, and 31st of December 1737; together with an Accompt of the Produce of the Sinking Fund in that Year; and to the Payment of what Debts, contracted before the 25th of December 1716, the said Fund hath been applied." Dominus Cancellarius declaravit præsens Parliamentum continuandum esse usque ad & in diem Jovis, vicesimum tertium diem instantis Februarii, hora undecima Auroræ, Dominis sic decernentibus. King's Answer to the Address for State of the National Debt. The Earl Fitzwalter acquainted the House, "That the Lords with White Staves (pursuant to the Order of Tuesday last) had presented to His Majesty the Address of this House, for a State of the National Debt; and that His Majesty had given Order, that the same be laid before this House accordingly." Hodie 3a vice lecta est Billa, intituled, "An Act for continuing the Duties upon Malt, Mum, Cyder, and Perry, in that Part of Great Britain called England; and for granting to His Majesty certain Duties upon Malt, Mum, Cyder, and Perry, in that Part of Great Britain called Scotland, for the Service of the Year One Thousand Seven Hundred and Thirty-eight." Mackenzie against M. of Powis. 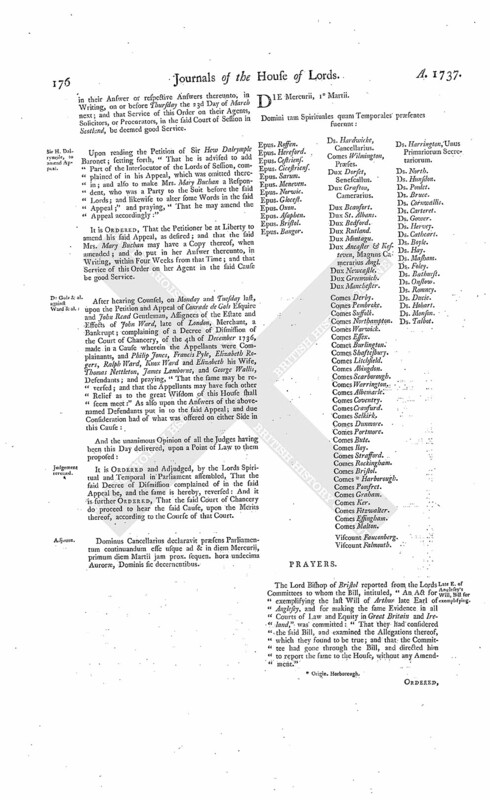 A Petition of William Marquis of Powis, Respondent to the Appeal of George Mackenzie Esquire, was presented, and read; setting forth, "That the Decree of the Court of Exchequer appealed from is but just passed; whereby the Petitioner has not been able to settle his Case, or instruct his Counsel, so as to be prepared for the Hearing To-morrow;" and praying, "That the same may be adjourned to a further Day." Ordered, That the Hearing of the said Cause be put off to Wednesday next. Late E. of Anglesey's Will, Bill for exemplifying. Hodie 2a vice lecta est Billa, intituled, "An Act for exemplifying the last Will of Arthur late Earl of Anglesey; and for making the same Evidence in all Courts of Law and Equity in Great Britain and Ireland." Viscount Torrington. Ld. Abp. Cant. Visc. Molyneux & al. Petition referred to Judges. It is Ordered, That the Consideration of the said Petition be, and is hereby, referred to the Lord Chief Justice of the Court of King's Bench and Mr. Justice Comyns; with the usual Directions, according to the Standing Order. Upon reading the Petition of Alexander Garret Esquire, Defendant in a Writ of Error brought into this House the last Session of Parliament; praying, "In regard Nicholas Lefebure, the Plaintiff in the said Writ, hath not assigned Errors thereon, pursuant to their Lordships Standing Order, that the same may be Non pros'd, with Costs:"
Order for a Non pros. It is Ordered, That the Petitioner do forthwith enter a Non pros. on the said Writ of Error, as desired; and that the Record be remitted to the Court of King's Bench, to the End Execution may be had upon the Judgement given in that Court, as if no such Writ of Error had been brought into this House: And further, That the Plaintiff in Error do pay, or cause to be paid, to the Defendant in Error, the Sum of Twenty Pounds for his Costs, by reason of the Delay of the Execution of the said Judgement. Wood peremptorily to answer Moor's Appeal. The House was informed, "That Henry Byam Wood, One of the Respondents to the Appeal of Robert Moore Esquire and others, had not put in his Answer thereunto, though his Clerk in Court had been duly served with the Order of this House for that Purpose." And thereupon Mr. Watty Collier being called in; and attesting upon Oath, "That he duly served the said Order;"
Ordered, That the said Henry Byam Wood do peremptorily put in his Answer to the said Appeal in a Week. 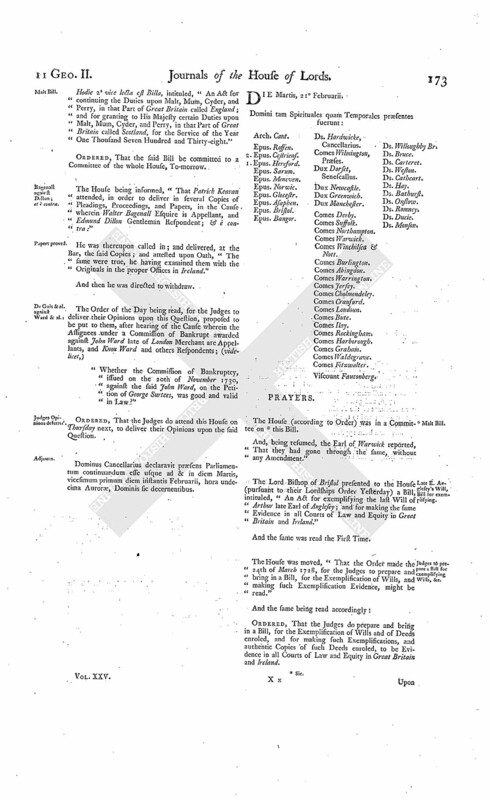 Upon reading the Petition and Appeal of Mr. Hugh Murray, of Kynnynmound, Advocate, accepting Trustee named in the last Settlement of James Rochead of Innerleith Baronet, deceased, in Behalf of the whole Persons for whose Behoof the said Trust-right is granted, and of James Dalrymple, Second Son of Sir James Dalrymple of Haills Baronet, and Hugh Somervell of Innerteill, Writer to His Majesty's Signet, Tutor ad Litem to the said James Dalrymple, an Infant; complaining of several Interlocutors of the Lords of Session in Scotland, made the 26th of January 1737/8, and 9th and 14th of February Instant, on the Behalf of Colonel James Cathcart and Mrs. Elizabeth Rochead; and praying, "That the same may be reversed, and such other Relief given the Appellants as to the House shall seem meet:"
It is Ordered, That the said Colonel James Cathcart and Mrs. Elizabeth Rochead may have a Copy of the said Appeal; and they are hereby required to put in their Answer or respective Answers thereunto, in Writing, on or before Thursday the 23d Day of March next; and that Service of this Order on their Agents, Solicitors, or Procurators, in the said Court of Session in Scotland, be deemed good Service. Sir H. Dalrymple, to amend Appeal. Upon reading the Petition of Sir Hew Dalrymple Baronet; setting forth, "That he is advised to add Part of the Interlocutor of the Lords of Session, complained of in his Appeal, which was omitted therein; and also to make Mrs. Mary Buchan a Respondent, who was a Party to the Suit before the said Lords; and likewise to alter some Words in the said Appeal;" and praying, "That he may amend the Appeal accordingly:"
It is Ordered, That the Petitioner be at Liberty to amend his said Appeal, as desired; and that the said Mrs. Mary Buchan may have a Copy thereof, when amended; and do put in her Answer thereunto, in Writing, within Four Weeks from that Time; and that Service of this Order on her Agent in the said Cause be good Service. 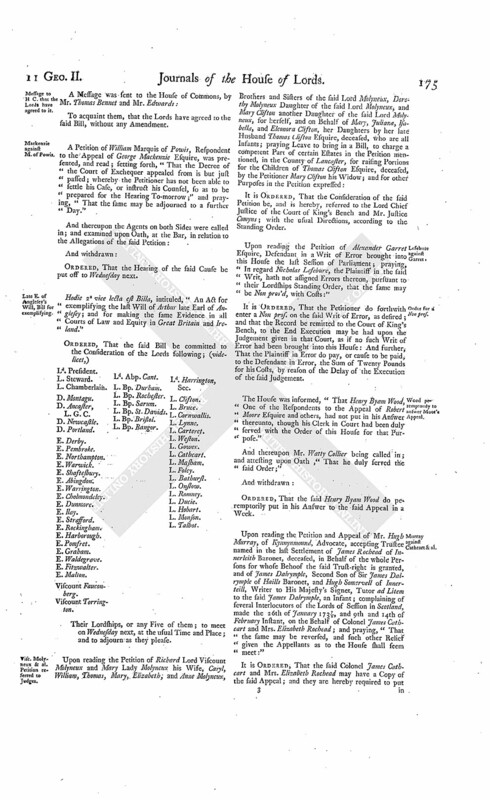 It is Ordered and Adjudged, by the Lords Spiritual and Temporal in Parliament assembled, That the said Decree of Dismission complained of in the said Appeal be, and the same is hereby, reversed: And it is further Ordered, That the said Court of Chancery do proceed to hear the said Cause, upon the Merits thereof, according to the Course of that Court. Dominus Cancellarius declaravit præsens Parliamentum continuandum esse usque ad & in diem Mercurii, primum diem Martii jam prox. sequen. hora undecima Auroræ, Dominis sic decernentibus.